Owl—a modern-day Indiana Jane—handles supernatural monsters, temperamental dragons, and slippery ninjas as she races to stop a brewing supernatural war in this fourth novel in the Owl series. The Silk Road was an ancient trade route paved with fortunes and tears in equal measure—the tears part mostly due to the distinct chance of being gutted by an opportunistic supernatural lying in wait. Somewhere among the trade cities lost to the ages, the Tiger Thieves—assassins who once guarded the Silk Road against the supernatural monsters that preyed on ancient caravans—still hide. Shame no one has seen one of them in over five hundred years, since they’re the only ones who might be able to help Owl stop the reign of the Electric Samurai and the descent of the world into supernatural chaos in all its eviscerating glory. 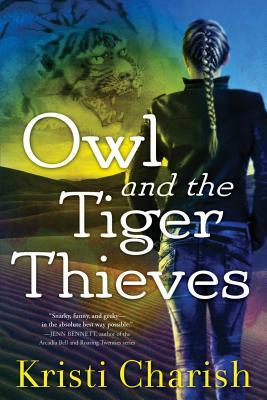 From a Peruvian jail to Venice to Timbuktu, Owl searches for the Tiger Thieves in the hopes of convincing them to help her—all while fetching artifacts and weapons for Mr. Kurosawa’s brewing supernatural war. Considering diplomatic negotiations aren’t exactly Owl’s strong suit, she has her work cut out for her. Not to mention, her sidekick on this adventure leaves a lot to be desired and little to trust. Poking a tiger is never a good idea, and tangling with the ancient assassins will take everything Owl has. Eventually, she’ll have to decide whether she’s a wayward archaeologist or just another cold-hearted thief.